Adult female hummingbird at native Coral Honeysuckle. Photo by Bud Hensley. If you haven’t already hung your hummingbird feeder in your garden, do it now. 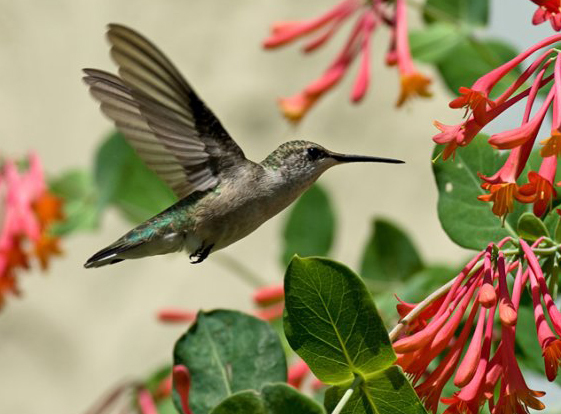 The spring migration of hummingbirds is in full swing right now and there have been several reports of hummingbirds in gardens in and around Buffalo. My first male showed up Wednesday, May 4 at 7:11 in the evening. He must have been in need of some instant energy as he made about six visits to my feeder before dark. Ruby throated hummingbirds (the kind we see in Western New York) migrate from Central America and Mexico starting in late January or early February. They arrive in the Gulf states by the last week of February and spend a few days resting and feeding. Then they start the last leg of their journey north to their summer breeding grounds, which include Western New York. Female hummingbird at Phygeliius. Photo by Suchitra Krishnaswamy. The males will generally arrive here first to stake out their territory. The females arrive a week or two later and immediately begin the process of building tiny nests as the males try to woo them. This is a stressful time for hummingbirds because they have to locate food sources after their long journey. Because of the cold spring we have had this year, several of the early spring plants that they use for food here are not blooming yet. 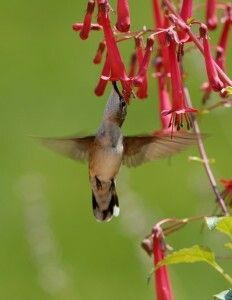 Some of the plants used by hummingbirds during the spring migration are Heuchera sanguinea (red flowered coral bells), Pulmonaria (lungwort), Aquilegia canadensis (native eastern columbine), Aesculus pavia (dwarf red buckeye tree), Dicentra (bleeding heart), Lonicera sempervirens (native coral honeysuckle vine), and native azaleas. Adult male hummingbird at Salvia guaranitica 'Black & Blue'. Photo by Bud Hensley. 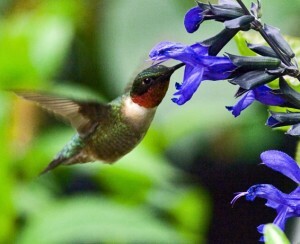 If the hummingbirds arrive before any nectar plants are blooming, they will rely on feeders. Note: When choosing garden plants to attract hummingbirds, stick with native plants rather than hybrids because many of the hybrids produce little if any nectar. Another native plant used by hummingbirds as spring moves toward summer is Silene virginica. The prolonged cold and wet weather has delayed the blooming of this plant, too, so hummingbirds will rely heavily on feeders. When you fill your hummingbird feeder, I would advise you not to use the commercial nectar mixes because we are not sure what effect the red dye has on these tiny jewels. It is easy and much cheaper to make your own nectar from one part plain white granulated sugar and four parts water. No other ingredients are needed nor safe to use. Penny Durnin has been feeding and gardening for hummingbirds since the 1980s, first in Louisiana, and since 1999 at her home in North Tonawanda. She has moderated the Hummingbird Forum online since 2006. 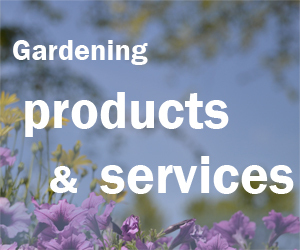 Do you have photos of hummingbirds or other lovely wildlife that visit your garden? Please share them on the Your Photos page. Attach the photo to an e-mail and send it to me at Connie@Buffalo-NiagaraGardening.com. Feel free to add information about what we see in the photo.